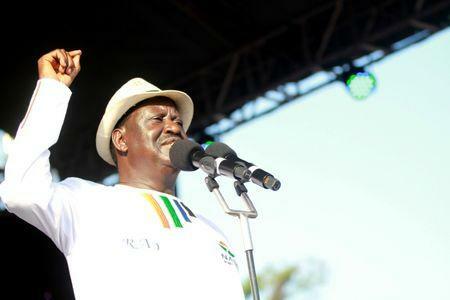 MOMBASA, Kenya (Reuters) - Kenyan opposition leader Raila Odinga, who withdrew from a presidential election re-run set for Oct. 26 saying it should only take place once wide-ranging reforms are undertaken, urged his supporters on Sunday to hold protests. Authorities have banned protests in central Nairobi and other hotspots in a bid to keep a lid on mounting political turmoil in the build-up to the repeat vote, in which Odinga had been set to challenge President Uhuru Kenyatta once again. The Supreme Court nullified Kenyatta's victory in the original election on Aug. 8, citing procedural irregularities. On Friday, Odinga said his withdrawal meant the poll had been "canceled" and that there should be fresh nominations for a new vote. "Come out in large numbers tomorrow like you have done today and fear no-one. This is your country and you have the right to protest," he told a crowd in the coastal city of Mombasa. The election board has said the vote will go ahead, with Kenyatta facing six other candidates, none of whom polled more than 1 percent in August. During a trip to London last week, Odinga told Reuters that he might consider returning to the Supreme Court for clarification on whether the Oct. 26 poll was legal. "I went to tell our friends in London the truth of what was happening here. Jubilee should know that we are not interested in a coalition government," he said, referring to Kenyatta's party. Despite the ban, protests have taken place in the East African country -- a regional and trade gateway which is the region's richest economy and an important Western ally in the fight against militant Islamists. On Friday, Kenyan police shot dead two people and wounded a third when a crowd tried to storm a police station in the town of Bondo in the southwest county of Siaya during a rally. Police also used teargas to break up small demonstrations in Kenya's three main cities -- Kisumu, the capital and the port of Mombasa -- the same day, defying the ban on rallies in city centers. Hospital authorities said 20 people were injured in Kisumu, an opposition stronghold. "I am ready to die for change in Kenya," James Orengo, an opposition senator and lawyer who led Odinga's successful petition at the Supreme Court, told the crowd in Mombasa, which numbered in the thousands.